M.B.B.S., M S (Gen. Surgery, M.S. (CardioThoracic), F.I.AC.S., F.C.C.P., F.I.C.S. Dr. Suresh Joshi is among the best heart surgeons and cardiothoracic surgeons in Mumbai, India. Dr. Joshi is the pioneer in the field of Minimally Invasive Heart Surgery in India and Beating Heart Coronary Bypass Surgery in Mumbai. Dr. Joshi has performed over “15000” operations till date. Dr. Joshi was first to perform and establish open heart surgery in Mumbai and western India. He is currently Director of the Department of Thoracic and Cardiovascular Surgery at Jaslok Hospital And Research Centre. 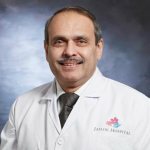 Dr. Suresh Joshi specializes in heart-related procedures like CABG, Minimal Invasive Open Heart Surgery, Aortic Aneurysm Operations, Paediatric Cardiac Surgeries, Complex Heart Valve repair, Heart Valve replacement, Bypass Surgery, Mitral Valve Replacement, Heart Transplant, Aortic Valve replacement. Dr. Suresh Joshi is a very reputed and one of the top heart surgeons and cardiovascular surgeons in Mumbai, India. Dr. Suresh Joshi has a practice spanning over three decades. Dr. Suresh Joshi was Associate Professor Cardiothoracic Surgery at KEM Hospital & Seth G.S. Medical College and the Grant Medical College & Sir J.J. Hospital, both in Mumbai. He further trained in Australia at the Royal Children Hospital Melbourne under Dr. Roger Mee and followed it up with training at the Royal Alfred Hospital, Melbourne and St Vincent’s Hospital, Sydney. He has been attached to many esteemed institutes in Mumbai like the Breach Candy Hospital, the Lilavati Hospital and Research Centre, Nanavati Hospital and Saifee Hospital. He is currently Director of the Department of Cardiovascular and Thoracic Surgery at Jaslok Hospital And Research Centre. Recipient Of Medical Excellence In Cardiac Surgery In India From Harvard University International (USA) in 2009. Prestigious Dr P.K. Sen Oration From Indian Association Of Cardiovascular & Thoracic Surgeons On “Minimally Invasive Cardiac Surgery”.